TOKYO (April 28, 2014) — Although he hadn’t coached in the NBA since 1988, Dr. Jack Ramsay’s distinguished broadcasting work on radio and TV, sharp basketball mind and his ever-present enthusiasm for the game made him a relevant, well-respected analyst. That continued until he stepped down from his ESPN duties in 2013 due to health issues. One of the best sports books I’ve ever read, David Halberstam’s timeless “The Breaks of the Game,” followed the 1979-80 Portland Trail Blazers’ season, just two seasons after Ramsay had guided the Blazers to an NBA championship. 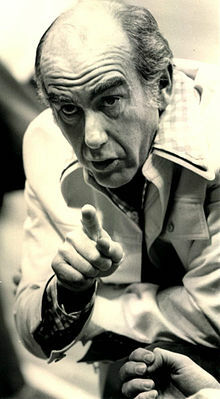 In 16 of his 20 full seasons as an NBA coach, Ramsay’s teams – Philadelphia 76ers, Buffalo Braves, Portland Trail Blazers and Indiana Pacers – advanced to the playoffs. As the GM, he also was the architect of the Sixers’ 1966-67 NBA title team. Even more peripatetic than Ramsay, Herb Brown’s college head coaching career began in 1964, followed by a lengthy tenure in the NBA, working for the Pistons (head coach and assistant), and assistant positions with the Sixers, Blazers, Rockets, Pacers, Suns, Hawks and Bobcats. He also coached in Spain and Israel and led teams in the Western Basketball Association (Tucson Gunners), Continental Basketball Association (Puerto Rico Coquis, Cincinnati Slammers) and International Basketball League (Baltimore BayRunners). He was the Japan women’s national team’s adviser coach last year, and Japan took home the FIBA Asia championship title for the first time in more than 40 years. Now 78, Brown has followed Ramsay’s career for decades and their paths crossed on countless occasions over the years. He’s had decades to formulate an opinion on Ramsay, and so I asked him for a few thoughts on the Hall of Fame coach earlier today. “Dr. Jack Ramsay never forgot you and always asked how you were doing. A remarkable and professional human being and international coaching icon,” added Brown, who received the National Association of Basketball Coaches’ International Committee Lifetime Achievement Award earlier this month in Texas. Ramsay, who retired No. 2 in all-time NBA coaching victories behind Red Auerbach, befriended coaches and players of all ages, and always had the same interest in the Xs and Os and machinations of the game as men decades younger.